The pace of reshoring among U.S.-based manufacturers dropped significantly in 2017, according to management consultancy A.T. Kearney, which has been tracking the trend since 2013. 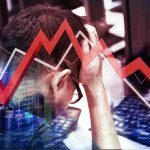 After rising to a five-year high in 2016 — in the wake of a U.S. presidential election that paid a lot of attention to manufacturing, job losses and China — the Reshoring Index declined 27 basis points. Among other metrics, (see full methodology at the end of this article) the Reshoring Index tracks the rate of U.S. imports versus U.S. manufacturing gross output. Goods imported from Asia’s 14 largest low-cost countries in 2017 rose by 8 percent to a staggering $55 billion — the largest one-year increase since the economic recovery of 2011, according to A.T. Kearney. U.S. imports of manufactured goods from offshore trading partners reached $751 billion last year. Of that $751 billion, China remains the dominant partner with $494 billion of imported manufactured goods. The historic trend isn’t positive for reshoring. 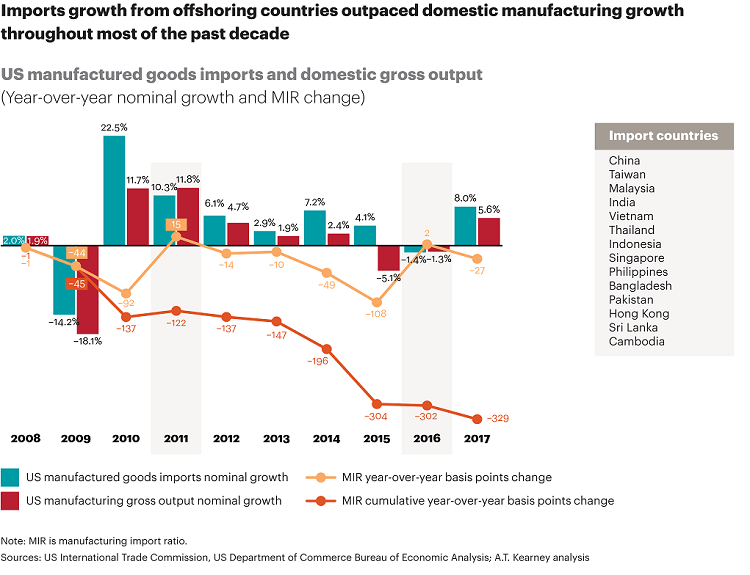 The growth rate of imports from low-cost countries has outpaced the growth of U.S. manufacturing gross output in four of the past five years. There are several reasons for this: there are still economic benefits from manufacturing overseas. Investments made in overseas manufacturing facilities are not easily abandoned. The U.S. is currently experiencing a shortage of skilled labor. Considering that tariffs and political posturing could change the direction of the reshoring trend, there are several possible outcomes in 2018. Electronics products have long been viewed as a prime candidate for reshoring. 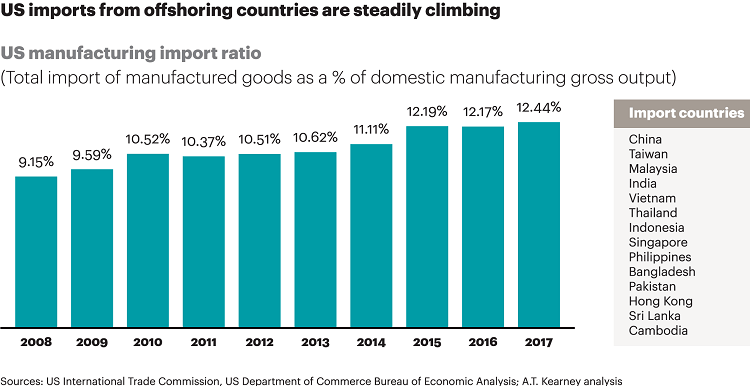 After more than a decade of high-tech manufacturing leaving the U.S. for China and other low-cost countries, U.S. domestic manufacturing in 2015 did increase its share relative to imports. As a result, in 2016, electronics imports from China declined by more than $7 billion. However, 2017’s data shows a return to the trend of increasing imports of electronics. The supplier ecosystem in the U.S. is not big enough to support increasing volumes, the report said. More significant is tightening global capacity. Substantial growth in subcomponent demand from mobile, industrial, automotive, and internet of things products has consumed excess capacity at major original component manufacturers. As a result, the global electronics industry is experiencing a severe shortage of components. U.S. manufacturing gross output was able to grow by 5.6 percent from 2016 to 2017 — the most since 2011. This domestic economic upswing prompted some manufacturers to rethink what to make in the U.S. versus elsewhere. There have been some high-profile reshoring cases: To accommodate the growing sales of Play-Doh, Hasbro Inc. opened a new manufacturing line in Massachusetts instead of sending production offshore. The company said the higher costs associated with domestic manufacturing would be offset by lower costs for transportation. 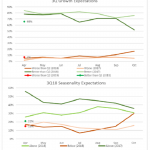 However, slim margins, a potential downturn in demand, and the significant investment of capital and time required are making component manufacturers cautious of expansion. 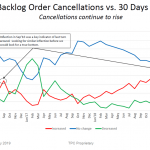 Instead, they are moving large strategic customers to the front of the waiting list for constrained subcomponents, which is making OEMs and EMS providers wary of reevaluating their overall supply chain at the risk of falling to the back of the line. To further complicate matters, foreign countries are now starting to compete with American manufacturing in new areas. China is no longer only a production base for developed-countries’ brands. 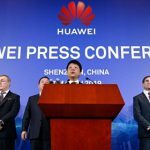 More products designed and marketed by Chinese companies are starting to appeal to American consumers, including Huawei’s telecom products, Anker electronics, and Haier home appliances. 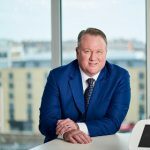 According to A.T. Kearney, Chinese automotive giant GAC Motor is looking to enter the U.S. market for SUVs in 2019 in a move that echoes earlier efforts by Japanese and South Korean manufacturers. If this trend continues, Chinese imports will not be purely about low cost, but also about product design and features. This poses additional challenges to U.S. manufacturers as it could attack their competitive position in the domestic market. If the goal of the U.S. is to expand its manufacturing base, reshoring isn’t the only solution, Gott said. American companies could manufacture more products in the U.S., and foreign companies, including those from China, could also expand their production in the Americas. The latter strategy, called foreign direct investment (FDI), could increase as Americans buy more consumer goods from Chinese and other Asian companies. China already has business-to-business operations in the U.S. for industrial products such as steel tubing and automotive parts. The $1.5-trillion tax cut that President Donald Trump signed into law at the end of 2017 is unlikely to spur reshoring, A.T. Kearney said. 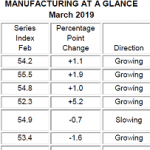 The combination of an overstimulated economy and a jobless rate that is the lowest it has been in more than a decade will likely result in even more imports when domestic manufacturing can’t keep up with growing consumer demand. Of course, the firm added, the global economy is an oil tanker rather than a speedboat. “It’s possible that the political posturing, potential tariffs, and tax cuts could turn the tide over time. But with many unknowns in trade policy, companies must understand all potential futures and develop contingency plans, including reshoring,” the report concluded. 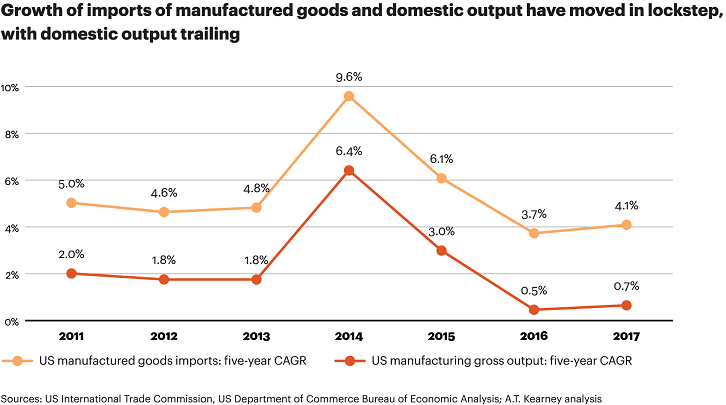 The objective of A.T. Kearney’s U.S. Reshoring Index is to assess actual reshored manufacturing—not manufacturing related to foreign direct investment (FDI), which is triggered by a very different set of macroeconomic factors—by comparing U.S. manufacturing gross output to import data from 14 low-cost countries. To calculate the Index, we first look at the import of manufactured goods from the 14 Asian countries that have traditionally been offshore trading partners: China, Taiwan, Malaysia, India, Vietnam, Thailand, Indonesia, Singapore, the Philippines, Bangladesh, Pakistan, Hong Kong, Sri Lanka, and Cambodia (see sidebar: A.T. Kearney Reshoring Database). Next, we examine U.S. domestic gross output of manufactured goods. Then, we calculate the manufacturing import ratio (MIR), which is simply the quotient of dividing the first number by the second. The U.S. Reshoring Index is the year-over-year change in the MIR, expressed in basis points. A positive number indicates net reshoring, which occurs if gross domestic output grew relatively faster than imports from the 14 offshore countries.